Although you are eating for two when you're pregnant, one of you is significantly smaller. Therefore, you don't have to eat twice as much. While weight gain is expected during pregnancy, it's important to keep it under control. In general, women should gain between 25 and 35 pounds during the 40 weeks of pregnancy. 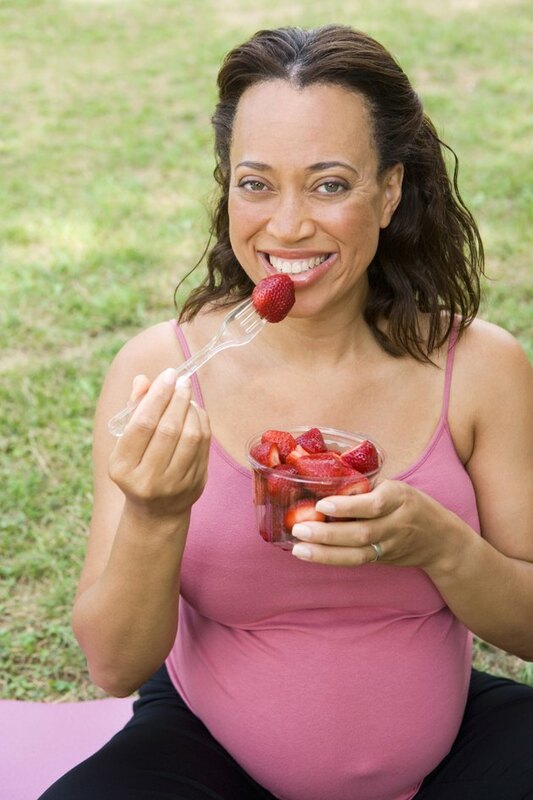 Being mindful of what you eat can help you minimize your pregnancy weight gain. When it comes to weight gain, it's all about calories. Eat more calories than you burn and you gain weight. While you do get to eat more calories when you're pregnant than when you're not, the total amount isn't that much. In fact, during the first trimester you don't need to eat any extra calories. During the second trimester you need an extra 340 calories per day, and during the third an extra 450 calories. While your individual calorie needs vary depending on your prepregnancy weight, height, age and activity level, most pregnant women can minimize weight gain by eating 1,800 calories during the first trimester, 2,200 calories during the second and 2,400 calories during the third. Pregnancy might leave you feeling incredibly hungry, especially during the second trimester. To help control hunger and minimize weight gain, make low-calorie fruits and veggies the main attraction at meals and your first choice for snacks. Fruits and vegetables are also a good source of a number of nutrients that you need for pregnancy, including vitamins A and C, iron and fiber. Include a rainbow of fruits and veggies each week to vary your nutrient intake. Grains such as bread, cereal, pasta and rice provide iron, B vitamins and folic acid. If you make most of your choices whole grain, you also get fiber, which can help control your insatiable hunger so you eat less. Eating more than 14 grams of fiber a day might decrease calorie intake by 10 percent, according to a 2001 article in "Nutrition Review." During your pregnancy, your fiber needs are the same as the general population's -- 25 to 30 grams per day. You can also save calories if you eat mostly lean sources of protein and low-fat or nonfat dairy. Lean protein sources include poultry, seafood, lean red meat, eggs and beans. Dairy foods are good sources of calcium and vitamin D, which both you and your baby need for strong bones. As a pregnant woman, you should get four servings of dairy foods a day; making most of your dairy low or nonfat can really save calories. For example, subbing 1 cup of nonfat milk for 1 cup of whole milk can save you 60 calories.